This post is actually a wrist-slap for me. Back at the beginning of the year I resolved to finish the year with fewer messy places than I started with and at first I did well. 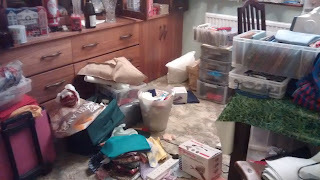 I sorted drawers and cupboards and even (more-or-less) sorted The Room Of Doom. But other parts have not gone so well. Back in July I decided that the sewing room / dining room/ spare bedroom had to be tackled and I pitched in with great enthusiasm. But it didn't last and this is the latest view of what I have decided to call the Room of Shame. This cannot go on. I need to get it sorted so that Louise can come and do her stuff with the cleaning. I have bits towards several Christmas presents somewhere in that mess and if I don't find them soon I am going to have to do some unnecessary spending to buy other presents. But the most important reason is that there are just two months left of this year and they are not ikely to be the least busy months of the year. I want to get to the end of the year with that resolution intact and well advanced. So my wrists are now well slapped. Watch this space! oh dear, good thing your house isn't up for sale like ours! It's quite an incentive to clear clutter. Cleaning, tidying, sorting can be quite enjoyable once you get stuck in ... it's getting motivated that's the problem. I was motivated recently when husband decided to convert some bookshelves on a gable-end wall in a bedroom into a wardrobe (he's made a very good job of it) and the moment the room was finished a friend phoned to say she would like to come and stay. That really spurred me on ... cupboard sorted, things taken to the tip, curtains dry-cleaned, you name it, it was done. So invite someone to come and visit, if only for afternoon tea, it might be the stick you need. The carrot at the end will be lovely clean and tidy home. Another idea is to treat yourself, as we have, into some new 'toys'. I have just taken delivery of a battery-operated, cordless vacuum cleaner. Not an expensive one, under £100, and boy, is it great! I can't believe how easy it has made cleaning and it can be taken off the 'stick' part to use as a small device for cleaning the stairs, work surfaces, etc. I love it! Come on, Mary, you can do it! Just tackle a bit each day and before you know it it will be done! Will be following. I am facing the same kind of clutter. I had to have help with some of it because of my back. However, I try to just pick up one thing from a table, the corner of the counter, the floor...and put it where it goes, hopefully to donation box or in the trash. Doing "one thing" usually results in doing more. Thanks for asking, Rivulet. I have been tackling messy places - but financial messy places rather than the Room of Shame. See my next post!